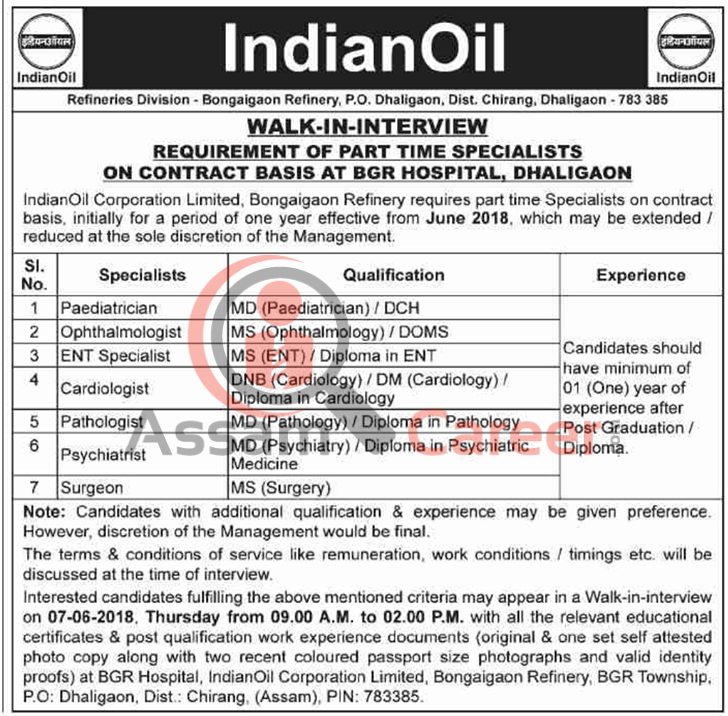 Indian Oil Corporation Limited, Bongaigaon Refinery requires part time Specialists on contract basis, initially for a period of one year effective from June 2018 which may be extended / reduced at the sole discretion of the Management. Educational Qualification: MD (Paediatrician)/ DCH with minimum 01(one) year of experience after Post Graduation/ Diploma. Educational Qualification: MS (Ophthalmology)/ DOMS with minimum 01(one) year of experience after Post Graduation/ Diploma. Educational Qualification: MS (ENT)/ Diploma in ENT with minimum 01(one) year of experience after Post Graduation/ Diploma. Educational Qualification: DNB (Cardiology)/ DM (Cardiology)/ Diploma in Cardiology with minimum 01(one) year of experience after Post Graduation/ Diploma. Educational Qualification: MD (Pathology)/ Diploma in Pathology with minimum 01(one) year of experience after Post Graduation/ Diploma. Educational Qualification: MD (Psychiatry)/ Diploma in Psychiatric Medicine with minimum 01(one) year of experience after Post Graduation/ Diploma. Educational Qualification: MS (Surgery) with minimum 01(one) year of experience after Post Graduation/ Diploma. How to apply: Interested candidates fulfilling the above mentioned criteria may appear in a Walk-in-interview on 07-06-2018, Thursday from 09.00 A.M. to 02.00 P.M. wilh all the relevant educational certificates & post qualification work experience documents (original & one set self attested photo copy along with two recent coloured passport size photographs and valid identity proofs) at BGR Hospital, Indian Oil Corporation Limited, Bongaigaon Refinery, BGR Township, PO: Dhaligaon, Dist: Chirang, (Assam), PIN: 783385.